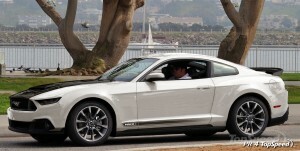 Could this be the first Mach 1 Mustang since the ever-popular 2003-2004 Mach 1s? There’s no denying it–we’re all eagerly awaiting the release of the 2015 Mustang. While Ford takes its good ‘ol time releasing the 6th generation of the iconic Ford Mustang, we’ll continue to speculate on what the car will look like and what trims will be offered. TopSpeed’s latest rendering speculates as to what the rumored 2015-2016 Mach 1 might look like. Based on the latest spy shots and 3D renderings produced from official Ford CAD designs, it appears their rendering might not be that far off. The winds blowing from Dearborn these days carry whispers that one of the next generation Mustang’s premium trims (be it a new, revamped SVT, the Mach 1 or GT350) is getting a high-revving, naturally aspirated V8 codenamed “Voodoo.” It’s possible the next mach 1 could have a 500+HP N/A variation of the Coyote motor revving to around 8500RPMs…wouldn’t that be nice. Ford is set to unveil this car at anytime during the coming months and when that time comes we should have a pretty good idea then if this is in fact an accurate representation of the next Mach 1 and, just as importantly, what power plant we’ll find under the hood. Next Entry Official: Ford Will Reveal The 2015 Mustang on December 5th! Where the hell is the seperation of the bumper and fender? it looks like a 1 piece?? The white doesn’t look bad but the red and black just are not doing it for me! !